Courtesy of Pro Arts Gallery. This month at Pro Arts Gallery, Rochelle Spencer, founder of the AfroSurreal Writers Workshop and co-editor of Skin: Short Fiction by Women Writers of Color, presents Let’s Play, an exhibition featuring local artists and writers of color who are all meditating on how play intersects with urban life in Oakland. Spencer, who’s finishing her Pro Arts’ Studio Lab Curatorial Residency, was inspired to explore how play can disrupt convention through an AfroSurrealist lens on black intuition and imagination and how the two fuel creative rebellion. The group exhibition features visual artwork and audio testimonies and excerpts that will be projected along with digital art. 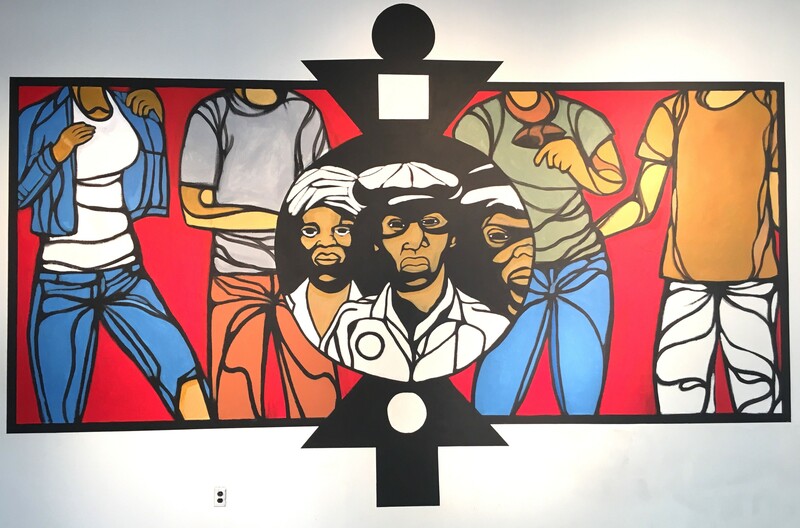 Among the visuals is a site-specific mural created by Kiss My Black Arts Collective (excerpt pictured) that examines black people’s relationship to play and the environment. Additional exhibited works include Rachel Eliza Griffith’s portrait photography of Black life, and Renee Alexander’s Craft’s digital projection piece on Carnival. Let’s Play also includes a participatory wall of poetry, to which visitors can contribute their experiences. Through June 29, no cover, 150 Frank H. Ogawa Plaza, Oakland. ProArtsGallery.com.